Hello fashionistas and trendsetters! 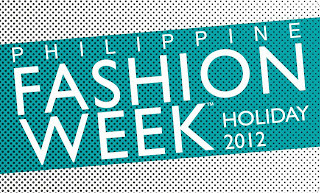 Here is the detailed schedule of Philippine Fashion Week Holiday 2012. The event will run from May 22, 2012 to May 27, 2012. Brands like Penshoppe, Oxygen, Jag, The Ramp Crossings, SM Ladies Fashion, and more will be featured. Creations of designers like Michael Cinco, Sassa Jimenez, Rajo Laurel, Veejay Floresca, Happy Andrada, etc. will be seen on the runway too.